I think of this soup as true comfort food. I remember eating it often while growing up…only, I usually just ate the canned version, which was so common in America. What strikes me the most is the flavor of the peas combined with other vegetables…and the thickness. This is truly a cold-weather soup that also works well during the later winter when bridging flavors and warmth from winter to spring. My version is packed with fresh flavors, but it is also quite hearty and more than eager to ward off cold weather. I like to include frozen peas in this recipe because they are consistent in their flavor and color. Fresh peas can be a bitter, and they are often odd-sized. 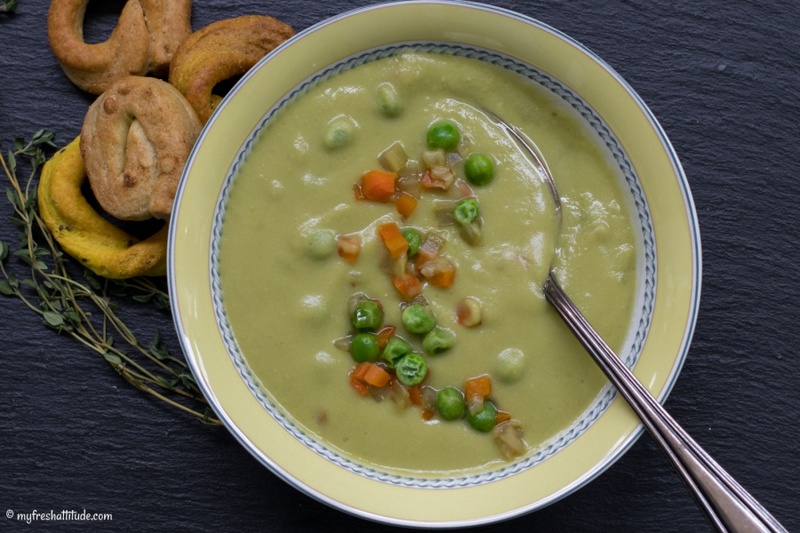 Adding frozen peas lends a great deal to the flavor of the soup as well as the color. I think this soup is fabulous served with a nice mirepoix (carrots, onions, celery) sliced thin and gently stewed in water.